To me, the precincts and legal chambers of Inner Temple feel like a kind of medieval maze: small brick arches, tiny concrete steps: small spaces designed for small people. The passages and alleyways have always held a certain mystique for me, along with an often-vague kind of ‘out-of-bounds’ feeling. It’s hardly surprising, as there has been a garden here since the Knights Templar arrived in 1160. The site has a long and fascinating history which has seen medieval orchards, formal parterres and flowering trees. 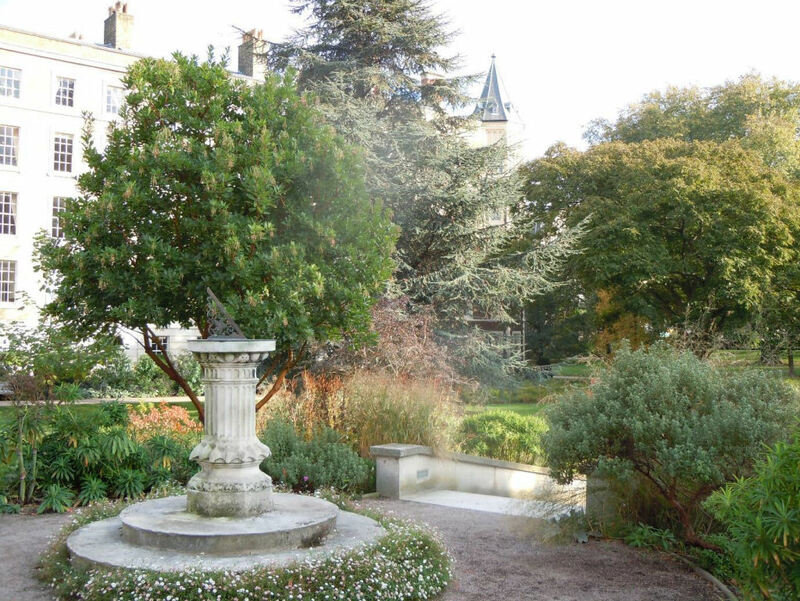 Developed during the 16th and 17th centuries, the current garden layout and planting dates from the early 19th century. 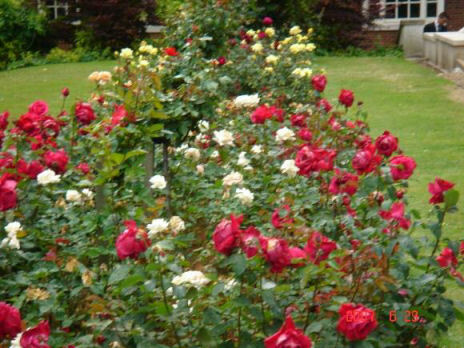 Renowned for its roses – even known by Shakespeare, who used the garden in Henry IV Part I as a setting for the meeting which sparked the War of the Roses. The surrounding buildings, many of significant architectural interest, help to create a very tranquil oasis enjoyed by the inherent legal profession, residents and other visitors. 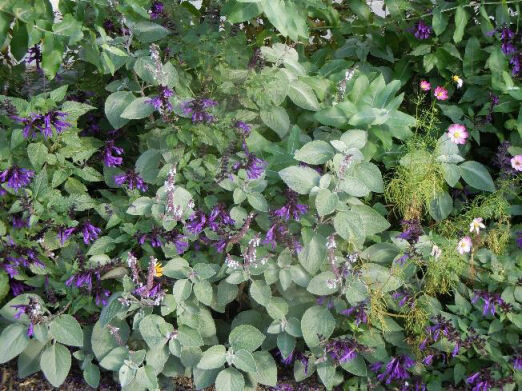 Rich plantings. Structure & history. Formality and informality. Inner Temple has it all. Whenever I’ve found myself walking along the Thames path, around the area of Temple Station, intriguing green spaces have appeared on my right-hand side. I’ve probably rattled and turned the handles of those highly-ornate gates many times, and probably always at the wrong time! Well, not on the day I was invited to meet with Sean Harkin, Inner Temple’s new Head Gardener. The garden today stretches over 3 acres, houses several unique borders and is home to many rare and unusual trees. There are areas of relative shade, where low light protects and cossets the likes of Epimediums, deciduous ferns, Sarcococcas and Hellebores. 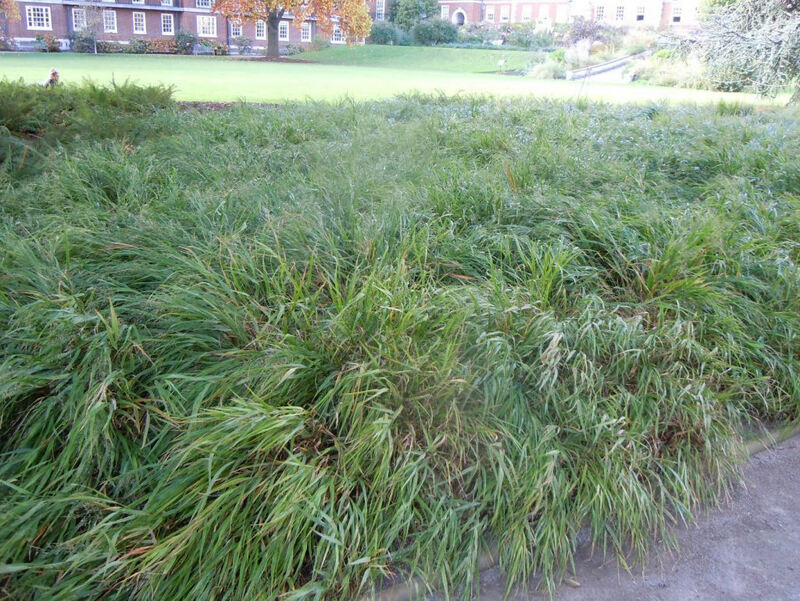 There’s also a large area of semi-shade where the Japanese Forest Grass Hakonechloa macra is grown en masse – stunning swathes of swaying swards. Now that’s not easy to say! Hakonechloa macra. Beautifully simple – stunning! 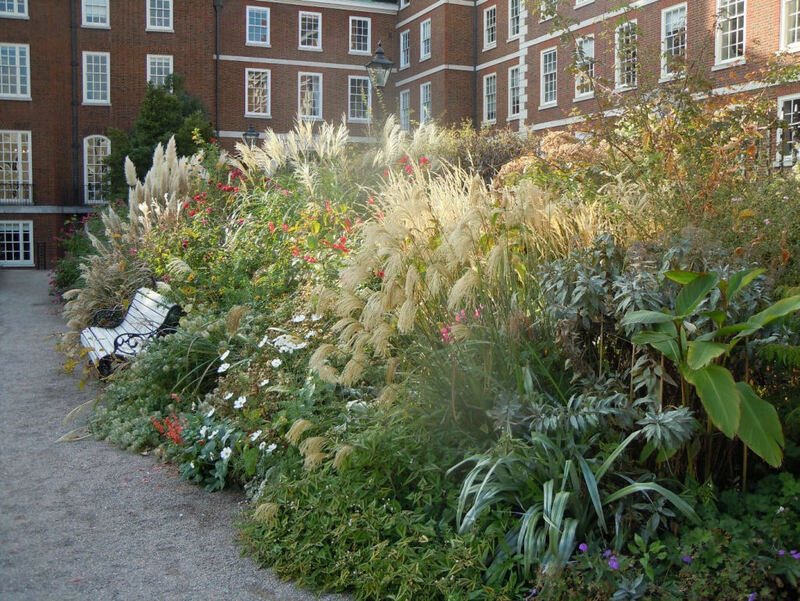 To the East sits a long border that cleverly combines permanent plantings of Miscanthus and Salvia with aspects of large bedding material (Plectrantus and dahlias etc) that may – or may not – be removed come winter. Of course, it’s always worth remembering that a London garden, surrounded by tall buildings will often house temperatures far above those experienced in more rural and exposed areas. London is a very different beast in that respect. At the top of the garden stands the High Border: very sunny I would imagine and home to many a sun lover. I thought the border looked amazing! The softened rays of a late October sun filtered their way through the pendulous heads of Miscanthus, became absorbed within the leaves of cannas and reflected gently from the silvery foliage of a steely Astelia. Pale blue Cosmos was still flowering strong, and as the plant layers escalated to the heady heights of tall Rudbeckia ‘Herbstonne’ and the exotic-looking Tetrapanax, I could see the woven intricacy of form, structure, colour and texture. Sean displays and gives scale to huge Dahlia heads in the High Border! 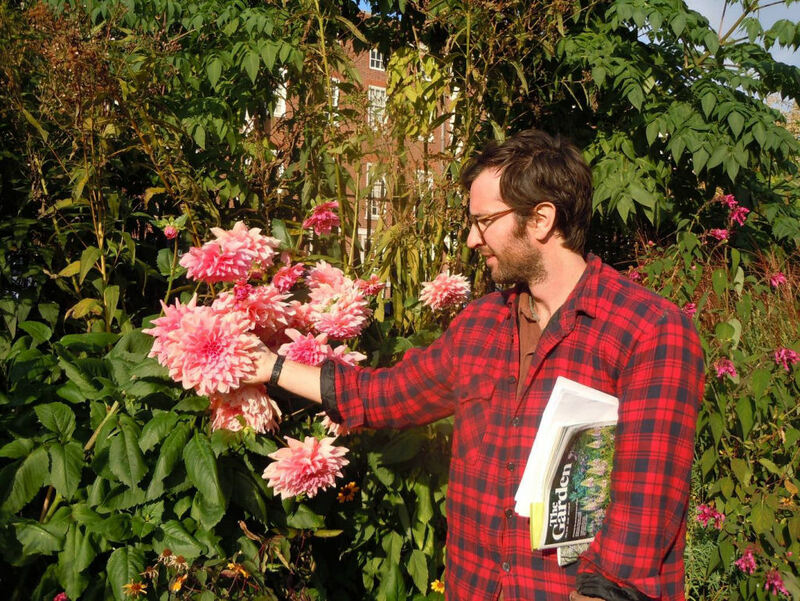 Sean Harkin arrived at the Inner Temple in April of this year, having previously studied for his diploma at RHS Wisley. 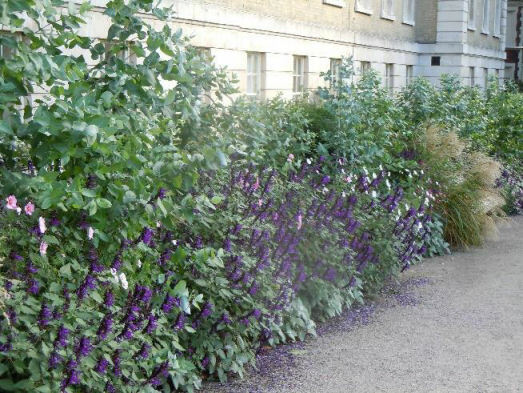 He has also been the National Trust’s Gardner in Residence for the city of Manchester and most recently, has led a team of gardeners at Kensington Palace. Sean is very aware of the fascinating history of the garden, as well as the reputation of his predecessor, Andrea Brusendorf and the work she and her team put in, resulting in the skilfully-rich and exuberant plantings he has inherited. However, Sean is a very experienced and skilled horticulturist; passionate about plants and gardens and generally a rather cool guy. This past summer in the garden – his first – must have felt (almost literally) like a baptism of fire: one of the longest and hottest summers on record. Sean manages a team of volunteers, who work for around 30 hours a week. He’s very grateful for all their hard work, and is also quick to acknowledge his very good fortune in attracting such keen and knowledgeable gardeners. Asked what his main challenges are, or might be in the future, Sean remains very aware of the sense of ownership felt by the numerous users of the garden: the public, the residents and of course, the legal fraternity who occupy chambers there. In a garden of such historic importance, the Head Gardener’s job is often one of trying to please most of the people, most of the time, as well as maintaining and developing the garden, – with a constantly creative eye that wishes to push the garden into new and exciting directions. 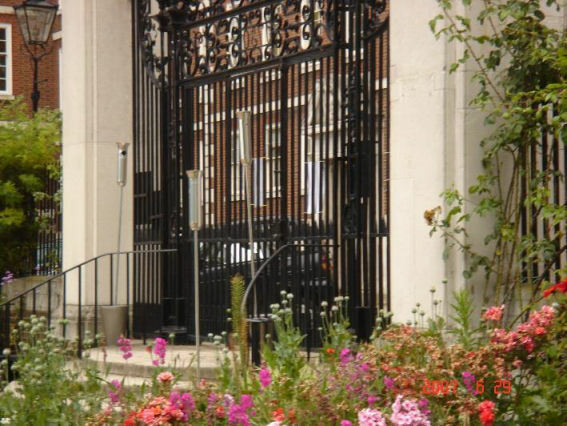 In 2007, the Inner Temple very kindly hosted the AGM of the MPGA and during the evening the prestigious London Spade award was presented to Mr L Ball, Head Gardener at the Inner Temple for over 11 years. To mark the occasion a gift of a semi-mature holly tree was presented by the MPGA but, owing to refurbishment work, was not planted until 2010. I must admit, I came away excited by what I saw in the garden. The generous mix of plants and planting styles and energetic ‘bedding’ schemes with a dash of the New Perennial thrown in, the mix of the formal and the informal, the Majestic trees and ornate landscaping. It’s all there at Inner Temple. 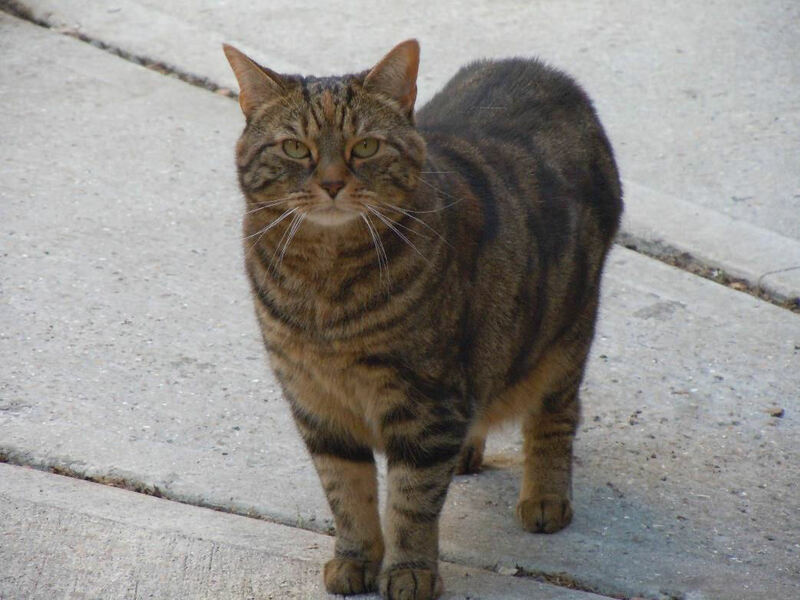 The real star of the garden, Sean’s cat Patsy! My advice would be to go and see the garden. Not just once, but many times over the coming months and years. I’m sure that witnessing the inevitable changes Sean and his team will undoubtedly bring to the garden will give us a real insight into the potential, and the often-certain limitations, that go with managing an historic space such as this. The garden is normally open to the public from 12.30 – 3.30 on weekdays. Access is via the main gate opposite the Treasury Office on Crown Office Row. This entry was posted in London Gardens and tagged Inner Temple Garden, Victoria Embankment London on November 5, 2018 by admin.